Ashtanga yoga (or Ashtanga Vinyasa Yoga) is a style of classical Indian yoga taught by Guru Sri K. Pattabhi Jois in the late 20th Century. This intense, energetic form of yoga involves acrobatic movements of the limbs and is the inspiration for the increasingly popular Power Yoga. Ashtanga translates into “eight limbs” (Ashta = eight, Anga = limbs), which stands for the eight limbs of the philosophy behind Ashtanga. The eight limbs of Ashtanga are Yama, Niyama, Asana, Pranayama, Pratyahara, Dharana, Dhyana, and Samadhi. The first two limbs represent the moral observance that allows Ashtanga yogis to be in harmony with other beings in the universe, and in harmony with themselves, respectively. Once a yogi masters the first two limbs of Ashtanga, he or she may progress further into the other six limbs. One of the practitioners bringing Ashtanga to the forefront of the modern yoga scene is Dr. Caroline Klebl. Dr. Klebl learned the art of Ashtanga while in India training under Sri K. Pattabhi Jois. Klebl spent nine years with Jois and received a PhD in Yoga from the University of Alternative Medicine. Now residing in beautiful Los Angeles, California, Caroline now spends her time traveling the world training fellow yoga practitioners via her original yoga teacher training programs and retreats. During these programs, students are able to study Ashtanga and finetune the techniques of this intricate art form directly from the master herself. I had the opportunity to sit down with Dr. Klebl and ask her a few questions about Ashtanga and her unique training seminars. What was it about Ashtanga that first attracted you to it? What makes it different from other forms of yoga? I started with Hatha Yoga classes, that included a handful of postures, that are practiced slowly and carefully. The postures are held for over a minute and often repeated. Ashtanga Vinyasa Yoga is unique for numerous reasons. There is a strong emphasis on Vinyasa, which are specific breath initiated movements, which link one posture to the next. Ashtanga Yoga includes set sequences of postures. There is a primary, intermediate and several advanced series of postures. The primary series includes over 70 yoga postures and countless vinyasa. It takes approximately 1 hour and 45 minutes to complete the primary series. In Ashtanga Yoga, the body is warmed up and kept warm by practicing vinyasa. The Ashtanga Yoga practice begins with 10 sun salutations. There is an emphasis on Ujjai Pranayama, slow deep breathing through the nose. Ashtanga Yoga induces a deeply meditative state. In the beginning, I was drawn to Ashtanga Yoga, because it was a set sequence of postures that I could practice on my own. I could wake up in the morning and practice in my living room. I noticed how my body was improving quickly and how I felt stronger, more flexible, happier and more in tune with my circumstances. The eight principles or limbs of Ashtanga are about learning to be in harmony with yourself, other beings, and the world. How do you think people will benefit from learning these principles and bringing them into their everyday lives? One of the main principles of Eastern Philosophy is karma. Karma is the force generated by a person’s actions, which determines the nature of future circumstances. Virtuous actions result in pleasurable experiences and unethical actions result in painful experiences. By adhering to the Yamas or ethical actions, such as ahimsa, non-harming, satya, truthfulness, asteya, non-theft and aparigraha, non-hoarding, future circumstances will be improved. In the Yoga Sutras it states that the practice of ahimsa, non-harming leads to all hostility being abandoned in one’s presence. By adhering to the Niyamas or observances, such as saucha, cleanliness, santosha, contentment and tapas, yoga practices, additional benefits will be experienced. The Yoga Sutras advise that the practice of santosha or contentment leads to supreme happiness and tapas or yoga practices diminish impurities and perfect the body and sense organs. Yoga practices also lead to the attainment of Siddhis or supernatural powers. Can you talk about your time studying Ashtanga in India? Did you learn anything during that time that inspired you to live your life differently? Practicing Ashtanga Yoga with Sri K Pattabhi Jois in Mysore, India was a spiritually uplifting experience. His classes started at 4:30am and continued until about 10:30am. Each student had a specific time slot and practiced for one and a half to two hours. When Pattabhi Jois entered the room, he chanted the Ashtanga Yoga Mantra, which describes the teachings of the linage of Yoga Gurus as awakening the happiness of the true self revealed and invokes Patanjali, the great yogic sage and author of the Yoga Sutras. After the mantra was completed with a long resonant Om, students would continue with their practice. The room was silent except for the deep Ujaii breathing of the yoga students and an occasional quiet thump as a student dropped from pinchamayurasana, forearm balance or sirshasana, headstand to a chaturanga dandasana, a low push up position with the elbows tucked in close to the body. Pattabhi Jois would walk through the room and adjust and deepen students asanas and teach new asanas to those who were ready to learn a new posture. Pattabhi Jois also chanted a closing mantra, the Mangala Mantra. The Mangala Mantra blesses the people of the world with happiness and prosperity. Practicing Ashtanga Yoga with Sri K Pattabhi Jois continuously inspired me to practice and teach yoga asana. What do you love about teaching yoga? What first inspired you to share your craft with others? Yoga is taught in disciplic succession, known as Guru Parampara. The teachings of yoga have been passed down from Guru to disciple for thousands of years. Teaching yoga connects you to a lineage of yoga teachers. The techniques are time tested and the benefits are far-reaching. The practice of Yoga asana can eliminate disease, improve the functions of the body, mind and sense organs and extend the life-span. Within the first few years of practicing yoga, I experienced noticeable beneficial changes in my body, health and mentality. Knee pain I had experienced for years disappeared. I also had numerous insightful experiences that verified the ability of yoga practices to awaken consciousness. “Practice, practice and all is coming.” repeated my guru. “99% practice and 1% theory.” And it worked. It is the personal experiences I’ve had with yoga that inspire me to teach and share the practice of yoga with others. How do you bring the principles of Ashtanga into your own life? What advice would you give to others wanting to do the same? Ashtanga Yoga is to be practiced on a daily basis. There are only a few traditional rest days; Saturdays, the new and full moon and for ladies the first three days of menstruation. To learn the practice of Ashtanga Vinyasa yoga correctly, one should seek the guidance of an accomplished practitioner and experienced teacher. How can yoga (and Ashtanga yoga specifically) improve your physical health? The primary or first series of Ashtanga Yoga is known as Yoga Chikitsa. Chikitsa means medical treatment or cure for disease. Yoga Chikitsa is a means to eliminate disease by practicing yoga. Yoga practice strengthens the body and the immune system and eliminates toxins. Yoga can be practiced for disease prevention as well as to reduce or eliminate any ailment. Ashtanga Yoga not only strengthens muscles, but also strengthens and purifies the organs. Yoga is also one of the best remedies for stress. How do you feel about the way yoga has been transformed by modern “Starbucks/lulu lemon” culture? Do you think this is harmful to yoga and do you think people should return to the type of yoga that is part of a lifestyle and philosophy? Yoga is an ancient technique that is still actively practiced to this day and has become en vogue in the west. People practice yoga for many reasons. To practice yoga to keep in shape and reduce stress is as valid as seeking liberation on a spiritual level. By purifying and improving the physical form, consciousness can move deeply into the body. The prosperity of yoga businesses have enabled the teachings of yoga to become available to everyone. To experience the vast benefits of yoga it is of course important to learn and practice the complete method, which includes yama(ethics) and niyama(observances) as well as a study of yoga philosophy, known as Jnana Yoga, the yoga of knowledge. You’ve been very successful in the yoga world. How did you reach this level of success and what advice would you give to others hoping for a career in yoga? I’ve been practicing yoga since I was 18 and took my first trip to India to practice with Sri K Pattabhi Jois when I was 21. I’ve been teaching yoga ever since. A one pointed dedication to learning, practicing and teaching yoga has led to my success. While I was training with Pattabhi Jois, I taught workshops all over the world, in Shanghai, Bangkok, Singapore, Bali, Jakarta, Kuala Lumpur, Kenya, Tanzania, South Africa, Dubai, Amsterdam, the UK, Scotland, Vienna, Prague, Barcelona and Ibiza. I taught yoga where yoga centers were interested in hosting workshops, retreats and teacher training courses. I wrote articles for yoga magazines, wrote a book on Ashtanga Yoga and produced an instructional Yoga DVD. In 2008, I developed 200 and 500 hour yoga teacher training courses, which I’ve taught in Los Angeles, Chicago, San Francisco and in beautiful retreat destinations all over the world. I’ve been dedicated to practicing and teaching yoga for over 20 years. To be successful in yoga, it is important to love the practice and enjoy teaching it to others. With one-pointed dedication, practice and perseverance one can attain to success. In 10 years, I see myself practicing and teaching yoga. I’m presently working on a Yoga Documentary, which features the history, benefits and method of yoga practice. It is a film about yoga and meditation in pop-culture and will include interviews with celebrities and Olympic gold medal athletes, who practice yoga as well as scientists, who have conducted research on yoga practice. I’d like yoga to be embraced by the public for the positive effect it has on the body and mind. What is your philosophy for teaching yoga and for yoga in general? Teaching yoga connects you to others. It is an opportunity to share your knowledge and experience and assist others with their yoga practice. Yoga enables the practitioner to perceive the nature of reality more clearly and make those choices, which will be of the greatest benefit to oneself and others. In the Yoga Sutras, Patanjali emphasizes that, the practice of yoga develops four states of awareness, analytical thinking, intuition, bliss and a sense of the self and that yoga creates a connection between the individual and supreme soul. Yoga can be practiced by everyone and yoga is meant to be shared. 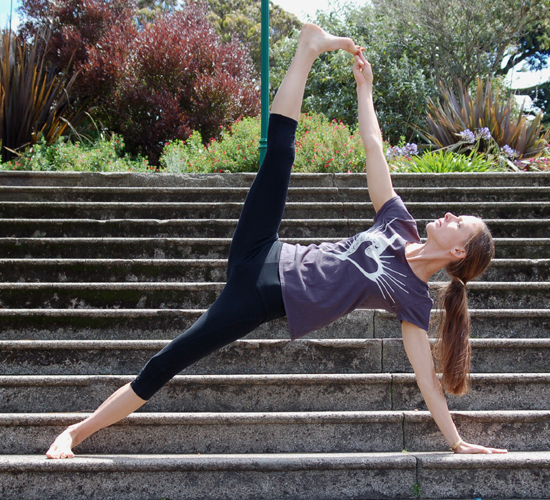 To learn more about Caroline Klebl, visit her website at https://www.sourceofyoga.com/. For those interested in learning more about Ashtanga yoga or becoming a yoga instructor, Caroline is currently offering yoga teacher training in Los Angeles and Chicago.